Crofts Estate Agents are pleased to bring to the market this three bedroom semi detached property which is being offered with NO FORWARD CHAIN. The property is close to the town centre and local schools, along with shops and take aways just a short walk round the corner. With off road parking to the front and a generous rear garden which makes this an ideal family home. The ground floor of the house comprises of the entrance hallway, front lounge with bay window, rear dining room and a modern white gloss kitchen at the rear of the property. Under the stairs you will find the utility space, however there are all the plumbings for a W/C still there to change it back to a downstairs toilet. The first floor has three bedrooms, two of which are doubles and the family bathroom provides a three piece suite. 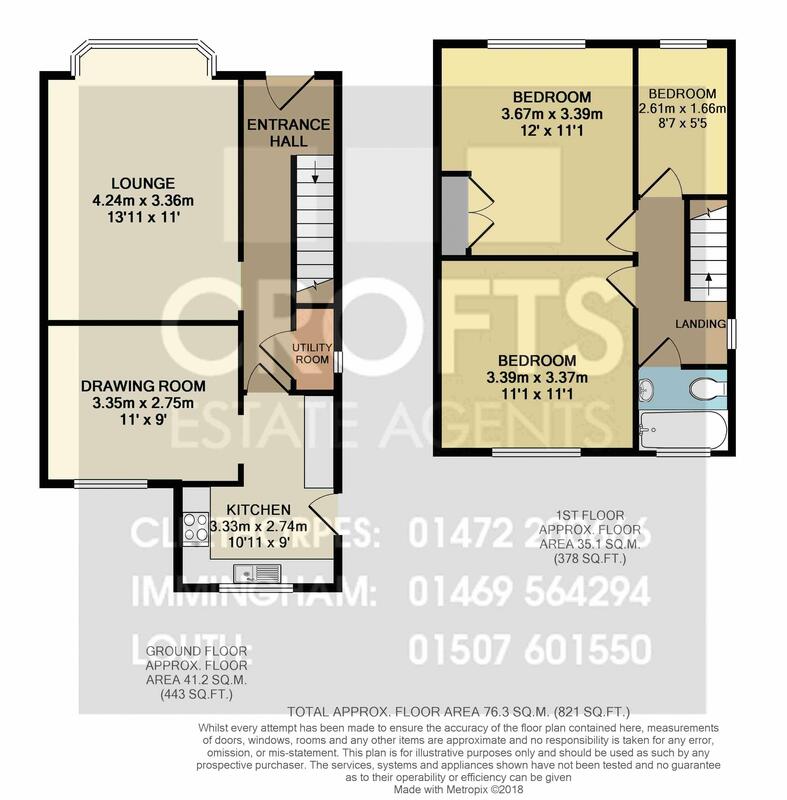 Viewings are available so contact our office to arrange yours today. The entrance hallway is a nice wide open space which has a wooden vinyl running throughout and it gives access into the front lounge, utility space under the stairs and the kitchen. The lounge is located to the front of the property and is a really homely space which is neutrally decorated throughout and has a nice front bay window which acts a a nice feature to the room. There is a fitted carpet and also a gas central heated radiator. The second of the reception rooms is located to the rear of the house and faces out onto the back garden. The room is neutrally decorated and has a a vinyl floor which runs through into the kitchen and hallway. The kitchen is a really modern design and has a range of wall and base units, along with full height units which provide excellent storage. The units are a white gloss finish and there is a rear uPVC window which faces out onto the back garden. The first of the bedrooms is located to the front of the property and is a double in size. White neutral decor running throughout, along with a front uPVC window and a gas central heated radiator. The second of the bedrooms is another double in size and faces out onto the back garden. There is a fitted carpet and white neutral decor with a rear uPVC window and gas central heated radiator. The third bedroom is the single room which is located to the front of the property. There is a front uPVC window and a gas central heated radiator. The family bathroom is located to the rear of the first floor and offers a three piece suite which includes a bath with shower over and shower screen, toilet and wash basin. The room is tiled throughout and has a modern finish. The rear garden is a really good size and has a wooden fence running throughout which gives it a degree of privacy. The main section of the garden is a large lawned area in the middle which is surrounded with a stoned edging which runs all around the lawn.